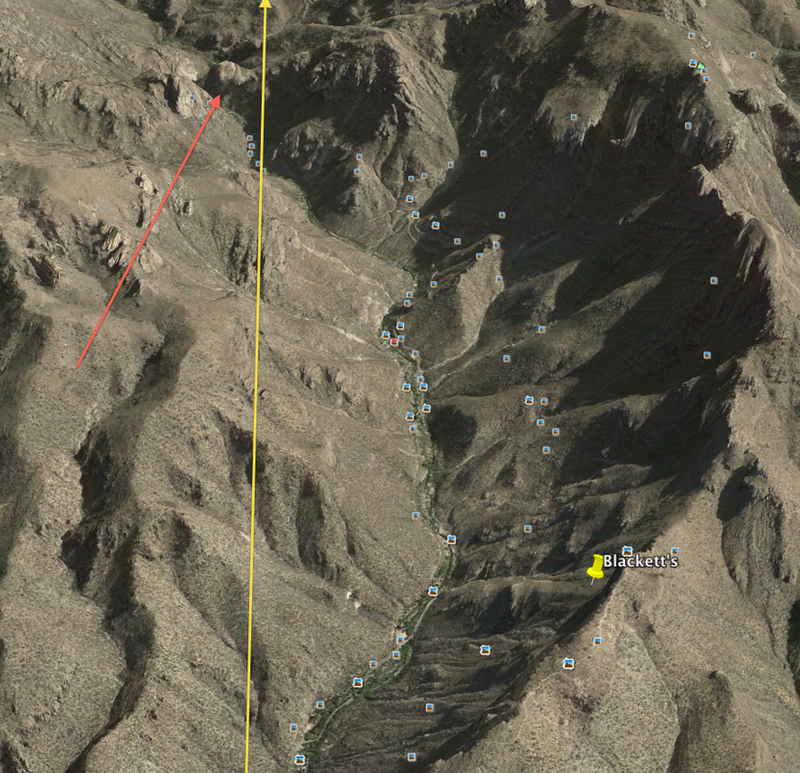 Yellow arrow from bottom is Sabino Canyon parking lot. 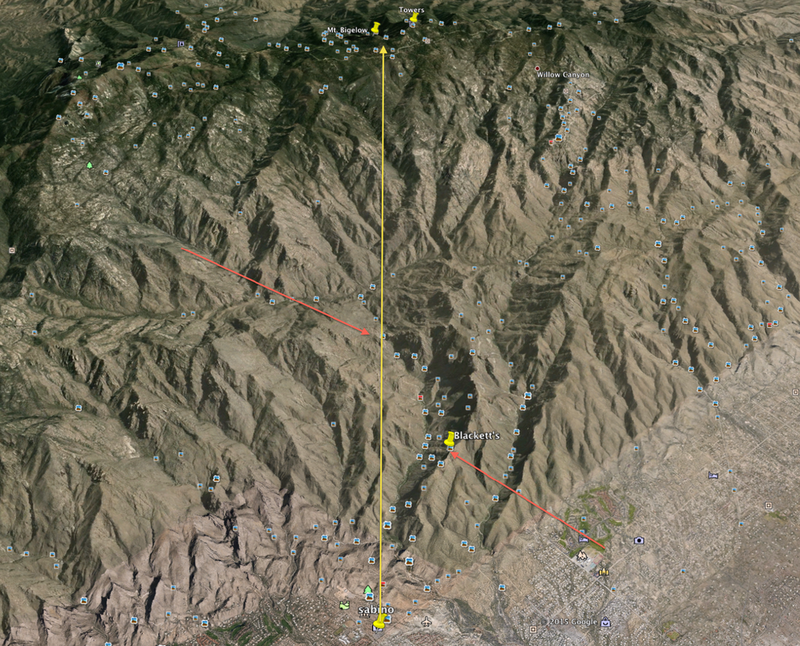 At the top point is where the UFO lights were said to be. 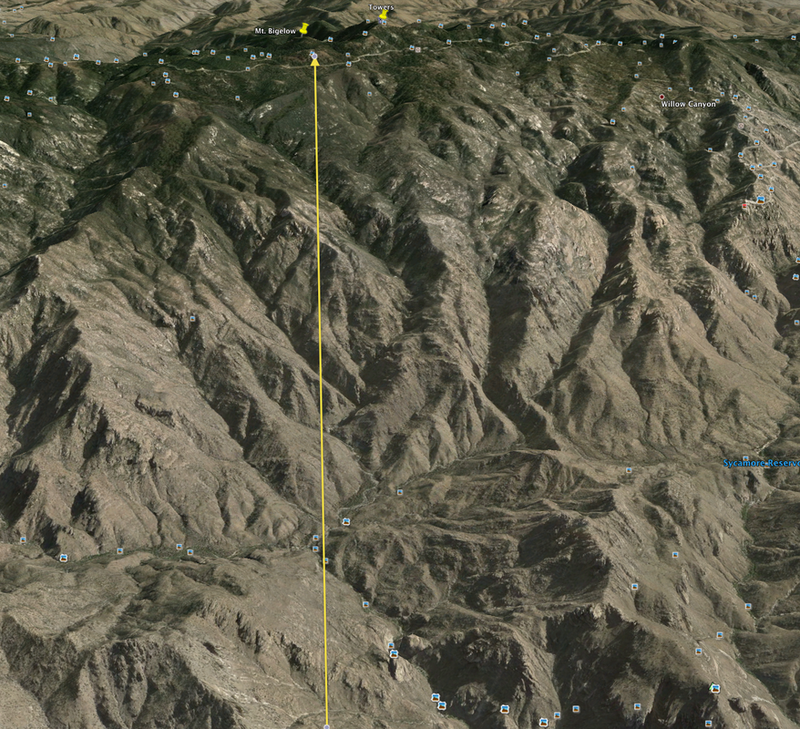 Red arrow on right is Blackett's ridge which is approx. 1 1/2 miles from our camera position. Red arrow on left is the small peak that shows in my video to the left of the UFO lights and is at the end of the park road at about 3 miles in. Yellow arrow is approx. line of sight from camera to UFO. Red arrow is close up of the little hill that appears to the left of the UFO in my video. Arrow below shows approx. 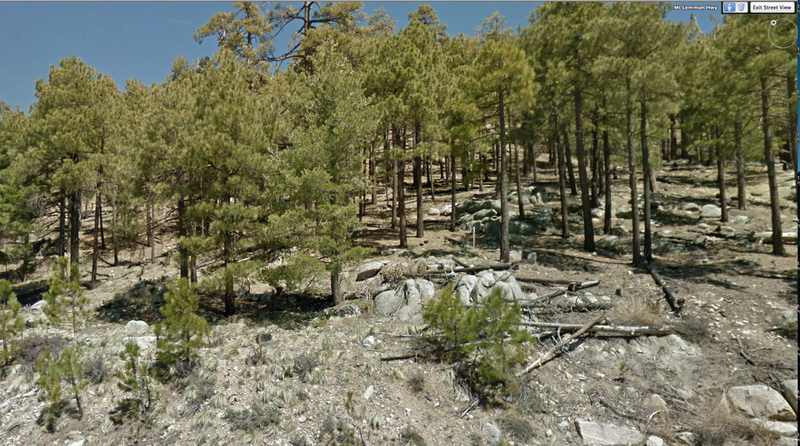 line of sight to UFO and shows no possible locations vehicles could be all the way up to the mountain hwy. Yellow arrow shows below approx. line where lights would have to be on Bigelow. 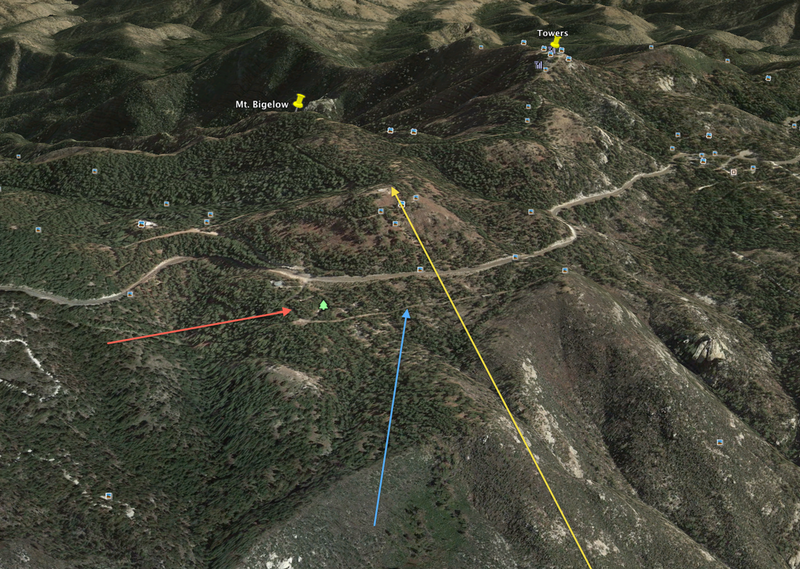 Red arrow is Whitetail campground and blue arrow is a primitive overgrown fire break and not a road or trail. Views of hwy. 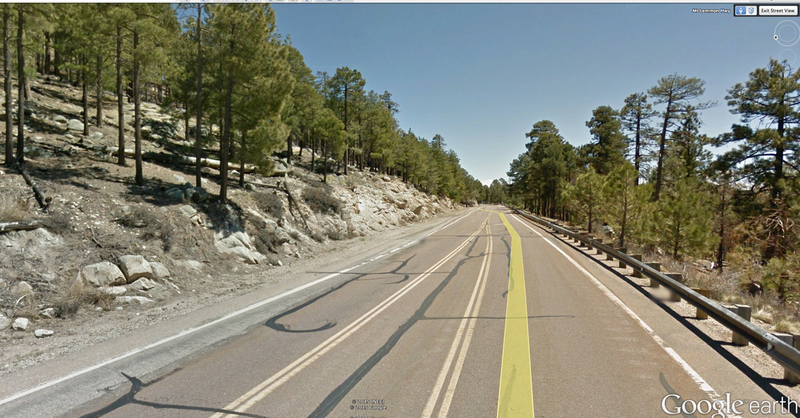 showing single lanes both ways with no pullouts plus guardrails and lots of trees. Road going back to Bigelow and to the lighted towers to the east. To the right is the hill that has the building and the unlighted towers on top. This is the hillside the 2nd set of UFO lights would have had to go up in order to reach the top of the hill from 1,000 ft. away.